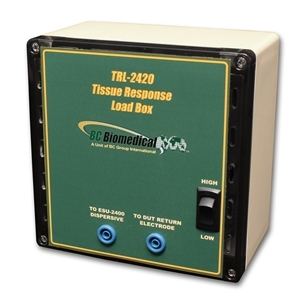 The TRL-2420 is an accessory to the BC Biomedical ESU- 2400 that is used to simulate the effect of changing tissue impedance during electrosurgery. The TRL-2420 contains two incandescent bulbs that are silicone coated for safety. As RF energy from the ESU generator (DUT) is applied to the bulbs, the impedance of the bulb changes, simulating the impedance change of tissue. Some RF generators have special output modes that detect the change of tissue impedance and automatically turn off the RF output when the change in impedance is detected. The ESU-2400 measures the current at the time when the RF output is turned off.